This Kids Science Newsletter includes a question of the month, current science events, science trivia and a simple science experiment. How much oil enters and pollutes our oceans each year? As of June 1, 2011 there have been 1448 tornadoes reported. Scientists have confirmed there were 1007. The deadly outbreaks have killed almost as many people this year as died from tornado related deaths in the previous 10 years. This comes as the hurricane season officially began on June 1st. scientists predict that this will be an above average hurricane season and at least one major hurricane will strike the US mainland. Let us hope that their predictions turn out to be wrong. A train conductor on a Vietnamese train between Ho Chin Minh City and Hanoi descovered four sacks of King Cobra snakes. The highly venomous snakes were being taken illegally by train to restaurants. The King Cobra snakes had their mouths sewed together but were moving around in the sacks on the train when the conductor found the bags. The snakes are protected by law, but snake meat is considered a delicacy by Vietnamese. Snake meat is often on restaurant menus. The snakes mouth's were unsewn and they were freed in the countryside. Songda became a super typhoon, which is a Category 5 hurricane off the coast of the Philippine Islands. As it moved north the typhoon turned into a Category 4 storm. As it approached Japan the storm cbecame a tropical storm that brought large amounts of rain to this earthquake ravaged region. The fungul disease that started in New York has now spread to Maine. The disease keeps bats from hibernating in the winter. The bats instead stay awake and cannot find enough insects to keep them alive during the winter. Bats are important for controlling mosquito populations and eating other insects. Scientists predict that some bat species will become extinct within 15 years in the northeast part of the United States. Bats are important polinators and mosquito populations could soar if this happens. A golden poison dart frog contains enough toxin in its skin to kill up to 100 people. You use 72 different muscles when you talk. If you are near a beach and see a jellyfish remember that they can sting even when they are dead. When candy canes were first made they did not have stripes. There are several species of fish that can come out of water and travel across the land. The eel catfish in African swamps comes on land to hunt beetles. The Milky Way, which is a spiral or barred spiral galaxy, contains between 100 and 400 billion stars. In this fun activity you will be making placemats using fresh leaves off of trees and bushes to make placemats you can use this summer. Gather your materials for this project before you start including a variety of leaves. Arrange the leaves on your placemat so they make an attractive collage. After the placemat is designed take the leaves off the paper and set them aside. Choose a variety of colors to paint your leaves. Turn the leaf over and press it down on your construction paper. 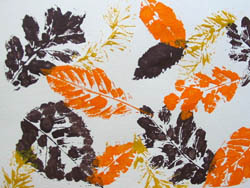 Using your fingers smooth over the top of the leaf so the paint is transferred to the paper. Repeat this step until you have completed your placemat. Let the paint dry thoroughly before covering it with clear contact paper to make a permanent placemat. Plants in the spring grow leaves to produce their own food. Through the process of photosynthesis they use sunlight for this process. According to a 1995 report by NASA 706 million gallons of oil enters and pollutes our oceans each year. Here is how it breaks down by categories. Please feel free to share this newsletter with a friend by forwarding it to them. If you know of a group who might enjoy the newsletter please let them know about it also. Comments? Ideas? Feedback? I'd love to hear from you. Just reply to this Just For Kids Science Newsletter and tell me what you think!